Elephant Games presents the newest addition to the Chimeras series! 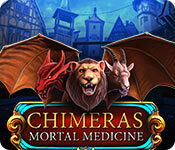 Chimeras: Mortal Medicine is rated 3.8 out of 5 by 8. Rated 5 out of 5 by miansc from Played the Collectors Edition and Loved it! Please click on the link Collectors Edition to see my review. I really enjoyed this game right from the start. I did not find anything that disappointed me. I usually buy the SE but I couldn't wait to have this game. I'm not always concerned with the extras that come with the Collectors Edition. If I did not already have this game, I would buy it right away. I don't know how you could go wrong especially on sale!! Even if It wasn't it is worth full price. IMO, grab it now !!! Rated 5 out of 5 by ninja226 from Deception, betrayal, Justice! Not sure why the lukewarm ratings on this game. I thought it was excellent and well done. This is tale of deception, betrayal, and justice and explains the legend behind the chimeras--the iconic animal of the series--that actually makes sense. It has more puzzles than games, and I was able to solve all puzzles without difficulty, so I feel positively brilliant, LOL. It's a fairly decent length game. The artwork is nicely done with attractive characters to feel sympathy for. I don't think you will regret the purchase of this game. Rated 4 out of 5 by Italia47 from Do I want to save the children? What do you think? I've completed the SE version, which in my opinion, was rather short but the storyline involved children and I love the kiddies. I think the intro was wonderful and the children were beautiful, especially the little infant in the cradle! I have been playing a lot of SE versions of late because oftentimes I feel I'm spending too much money on whistles and bells that are not always needed. Sure you get the bonus games which may continue the storyline for bigger or better things or not. You take a chance, I think. I think all devs need to concentrate on strategy, an accurate map, and game flow. Sometimes I don't care about the collectibles or morphing objects. I just want to get on with the game and the storyline should be intriguing. I felt this was a very good SE version. Elephant Games, bravo! I love the Elephant Games developers. Though this game was short and somewhat boring, it was doable. The game-play was pretty much what I expected from other developers--silly and irrational! Why would I go way back to scene one or two to retrieve an item when I'm in scene six already? Or those games where you climb down a well into a dungeon only to have to go back up the well to the house to retrieve any given item to complete it. You get my gist? It's so typical of most developers I think. But I've learned to live with it. But sometimes I wonder if all devs really read our reviews. The mini-games were pretty good and so were the puzzles. Not very challenging but tedious. Some puzzles required a lot of patience and others were way too easy. The HOPS were very good. I loved it all! Interactive, silhouettes, you name it! I like a good transporter map but sometimes this map was lacking, so the hint button became a good navigator for me at times. I like to challenge myself and not refer to the map at all. But when you need to get rid of your items in the inventory and have to go back n' forth, it is direly needed. Nonetheless, this is a very good, short game. I love the kiddies and I loved the ending. But as games go, it's all elementary my dears! I always look forward to the Chimeras series, so devs keep up the good work! Rated 4 out of 5 by Yanie1020 from Nice Game But Easy Puzzles This was a decent (but short) game. Graphics, music, HOG's were fine but the puzzles were mostly way too easy. I like puzzles with a challenge. Thus four stars instead of five. 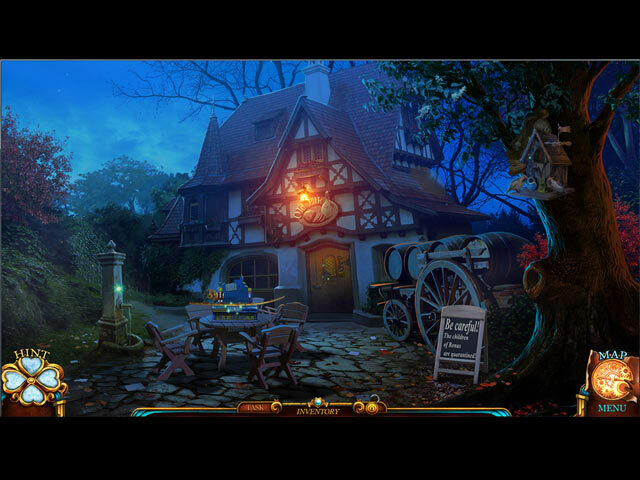 Rated 4 out of 5 by chrmn2k from Enjoyable Hidden Object Game! I was surprised by the negative review and I disagree. The game opens with a HOS and kept up the scenes that I purchase HOGs for. Graphics and music were good and the storyline was dorky, but adequate. If you like a fair story to accompany your urge for HOs, then this is your game. Sometimes, simplicity is the key to good entertainment! Rated 3 out of 5 by AdrianaIP from Ho hum Nice flow, although most of the time you spend looking for something that will fit in the opening. The storyline is silly. Not the poisoning plot, but the fact that the suspect is a were-chimera. Why did they do it? Because they realized that the titles was Chimeras, and their plot had nothing to do with chimeras??? So, let's make a guy a were-chimera. I could not take it seriously after that.. There are better games out there, but if you got a free coupon, you could do worse than this. Rated 3 out of 5 by pennmom36 from I'VE NEARLY FINISHED PLAYING THIS EDITION OF CHIMERAS AND I STILL DON'T SEE THE CONNECTION TO A CHIMERA This series is supposed to be about Chimeras, the terrifying beast of Greek mythology, a fire breathing creature with a lion's head, a goat's body and the tail of a serpent. She (yes, Chimera's are females) did make an appearance a couple of times but for the most part, this is a game with the same storyline that has been told a hundred different ways. You are a detective called to the town of Ronas to catch an escaped criminal responsible for poisoning all of the children in the town. Of course, your services have only been requested once the child of the wealthy Lankerman family has become ill.The local doctor has been paid quite handsomely to find a cure, but the cure has been compromised and now everyone is pointing their fingers at the good doctor accusing him of murder. Where does the chimeras come into play? This game doesn't have a thing to do with the mythological flying creature which make this game really no different than any other HOPA game. The original Chimeras was a fantastic game because the game was all about the beast and how to stop him from creating chaos. The graphics are crisp and clear, but they also have an abundance of purple and blue hues that are overwhelming at times, after the demo, I found most of the scenes almost cartoonish. In the Collector's Edition version, there's plenty of bling, 12 Collectible Cards (January through December) with the tradition's of Ronas, several Achievements to earn, 36 very large, can't possibly miss Jigsaw Puzzle Pieces that allow you to assemble 3 twelve piece jigsaw puzzles to use as Screensavers, and 29 Morphing Umbrella's. The puzzle pieces are way too big to present any kind of challenge because they stick out like a sore thumb, and the Morphing Umbrella's may as well have a neon sign under them because they morph by opening and closing, and the umbrella's are hard to miss because they are way too obvious, and look out of place. 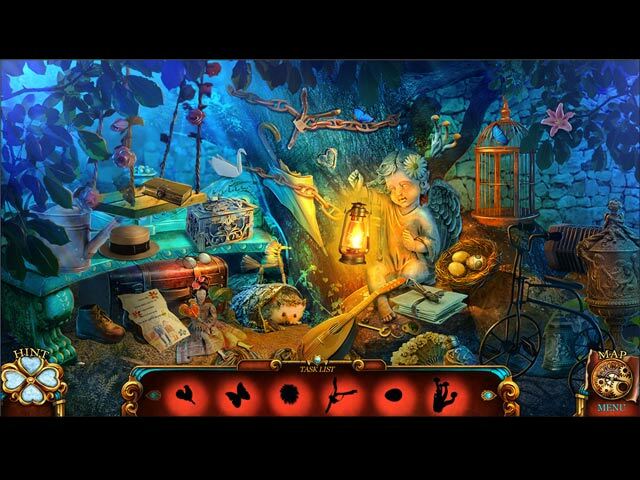 The Hidden Object Scenes lack imagination, but there's only so much you can do with hiding objects in a pile of junk. Most of the HOP's are slightly interactive List finds but there are also Silhouetted Shape finds. The Mini Games are very simple, but a few games are offered in an Easy or Hard mode. Below are brief descriptions of some of the games you'll encounter during the demo: 1) Assemble torn note fragments. 2) Select beetles in the correct order. 3) Swap positions of blue and red tokens. 4) Select two bees at a time to find matching symbols. 5) Swap books to replicate pattern shown on clue. 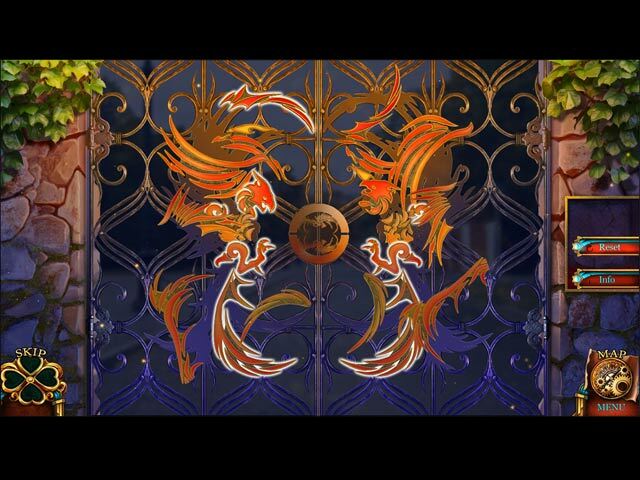 6) Restore the image on the gates by rotating the orange sections. 7) Recreate the image from the corks to change the floor image, changing one may affect others. 8) Select colored gems according to clue shown. 9) Swap puzzle tiles to restore the image. 10) Place tokens in the correct order to show the growth of the tree. 11) Remove the cubes from the board by combining 2 matching cube halves from the sides of the board then place the cubes on the board to create rows of 3 matching cubes. The Collector's Edition has 16 Wallpapers, 12 Concept Art pictures, 5 Music Soundtracks, 18 Achievements to earn, 12 Collectible traditions of Ronas Cards, a Secret Room, 36 Collectible Jigsaw Puzzle Pieces to assemble into 3 different Screensaver pictures, 29 Morphing Umbrella's that simply open and close, a built in Strategy Guide and a Bonus Chapter, enjoy! Rated 2 out of 5 by biscuitsmama from A GAME WITH POTENTIAL BUT DIDN’T LIVE UP TO THE STANDARD OF CHIMERAS In Chimeras: Mortal Medicine you play the game as a detective who has been asked to investigate a mysterious illness that has fallen upon the children in the town of Ronas. The town’s doctor created a vaccine that took the life of his daughter and now he is accused of murder and faces the executioner’s axe. It seems the illness started when a dark stranger visited Ronas but he has disappeared. Now detective, you must not only find the stranger who might be the cause of the epidemic, but you must prove the innocence of the doctor as well. Chimeras Mortal Medicine is game number four in the series. I absolutely loved the first game Tune of Revenge and had high hopes for the subsequent games but some were a disappointment. At least for me, Mortal Medicine is better than the previous game in the series and although it is still early in the game, I am enjoying the HOPS, puzzles and storyline. The game offers four modes of gameplay – Casual, Detective, Super, and Custom. Hints and skips can be set in a range of 15 – 90 seconds. I would suggest turning off the sparkles in the custom mode because more seasoned gamers will hate having huge areas of sparkles all over each screen. Your tools include an integrated transporter type map that is quite helpful. I find the HOPS to be enjoyable mainly because list types have always been my favorite. Although the HOPS are varied in type, I am not fond of the silhouette scenes. The puzzles, although on the easy side, are quite fun and I find them enjoyable. If you prefer the CE version of games Mortal Medicine has collectibles that include puzzle pieces, cards, and morphing objects to find throughout the game. The standard fare includes 16 wallpapers, 12 concept art, screensavers that will be created by the puzzle pieces, 5 music tracks, an album created by the cards, a secret room, bonus chapter, a 45 page strategy guide, and let’s not forget those achievements that are earned aw we play. All in all, Mortal Medicine offers a nice CE package. When Mortal Medicine was released I had high hopes for the game and gave it a high 5-star rating. What a huge mistake. It wasn’t long before I realized how boring the game was and nothing like a Chimeras game should be. I don’t know who the creative force behind the Mammoth team is now but their games have for the most part gone into the cellar. Most of us who have played HOPAs for a very long time, have seen games that were once unique and almost classics, deteriorate with sequel after sequel until there is nothing new or refreshing left to be found. I don’t usually cry “same ole, same ole”, but the endless sequels are destroying HOPA games. Then along comes Mortal Medicine, a sequel that had nothing of the wonderful story that made Tune of Revenge a top-notch game. Please try the demo but be aware that, IMHO, the game soon fails to hit the mark.